RelishTheDish – as the name suggests – is shifting focus from the restaurant to the dish itself. 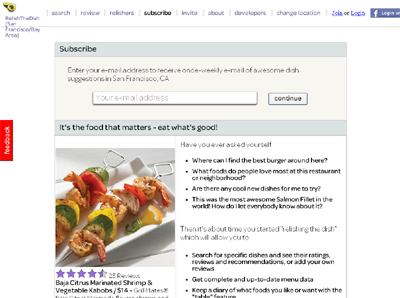 Users can search for specific dish items around their area, rate and review dishes, save a history of what they like, recommend dishes directly to other people via e-mail or on RelishTheDish, enter their likes and dislikes that allow better personalized food recommendations. The competition is focusing on the restaurant – reviewing, rating and recommending restaurants – which means users usually have to wade through many reviews to find out what’s good at the restaurant. By focusing on the dish, we’re making it more efficient to decide which restaurant to go to based on what’s available and popular at the restaurant.